Perhaps you know Olive Garden as your neighborhood joint that has food that sounds Italian, looks American, and tastes generally buttery. They of the unlimited soup-and-breadsticks lunch, of those well-lit commercials featuring shrimp scampi somersaulting from pan to plate without a care in the world. 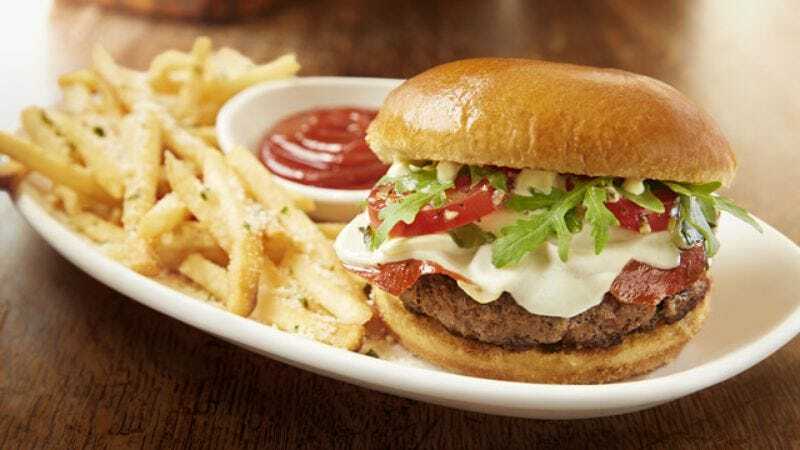 But now the casual-dining restaurant is making a new foray into the stomachs of Americans everywhere by introducing the Olive Garden burger. Recently the chain discovered it was losing customers at crucial mealtimes, because nothing on its menu satisfied that all-American craving for a burger and fries. Enter the Italiano, a burger topped with mozzarella, proscuitto, pesto, and aioli, accompanied by garlic Parmesan fries. Pros: It’s not slathered in alfredo sauce. Cons: It’s a burger. At Olive Garden.